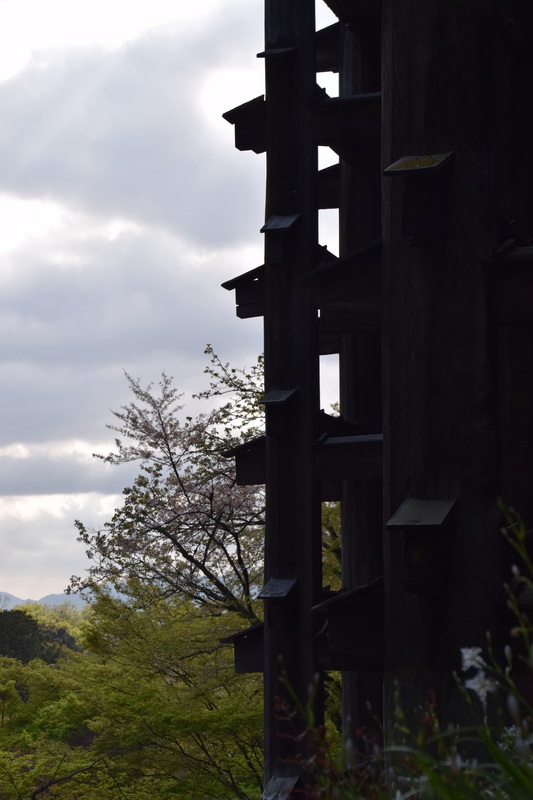 There is surely no better place in the world than Japan to see amazing castles, temples and shrines; and to marvel at the propensity for men in power to predictably build to the “mine is bigger than yours” maxim. 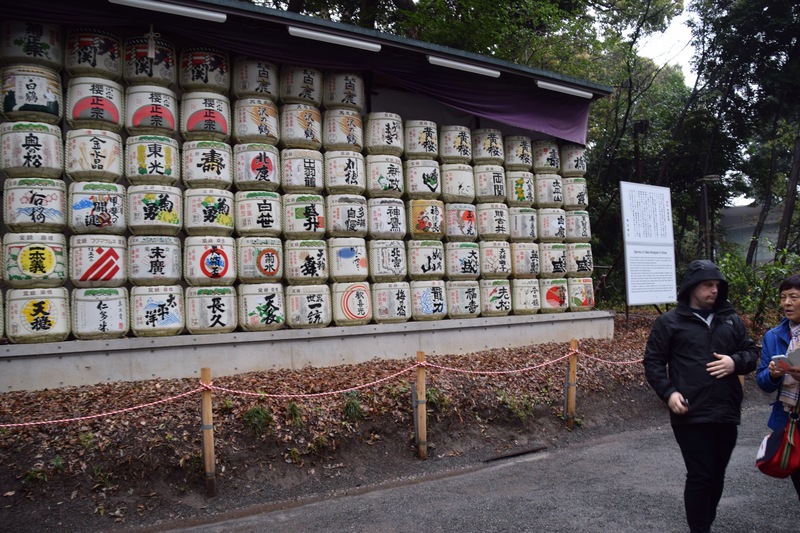 We started our exploration at Meiji in Tokyo, a beautiful temple set in a beautiful park; the entrance pathway flanked by donated barrels of sake on one side (Howard cynically pronounced that each brewer succumbs to peer pressure each year to refill their barrels) and on the other side of the path, an even more cynical attempt by French winemakers to secure a place in the hearts and minds of Japanese wine drinkers by the one off donation of an equivalent wall of oak barrels, by now no doubt full of wholly undrinkable wine! Next stop Kyoto, the ultimate place for templing! Howard compromised on a selected package of highlights, in recognition that two small children (and their mother) have limited capacity for appreciating old buildings! The palace with the nightingale floors was amazing in its subtlety, build so that the floors literally sing, no matter how light footed the intruder (a warning for the rulers of the day of any approaching ninja attackers). No photos allowed inside, but the gardens were lovely too. Then on to join the seething mass on a mission to see the Golden Temple… Beautiful but lacking the promised serenity. For the first time on our trip, feeling a little over the masses of tour groups, many lacking the inherent politeness and consideration of the locals. 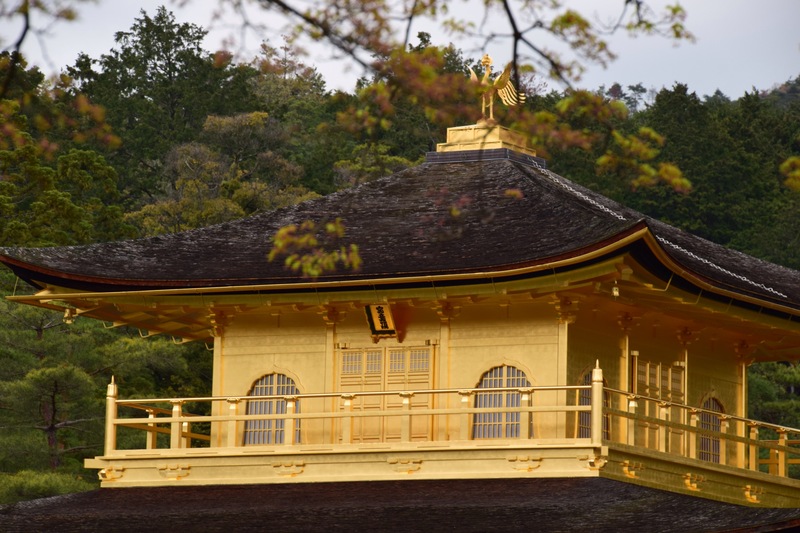 Howard did save the best for last – Kyomisidera – pronouncing he would be “very disappointed” if I didn’t battle yet more crowds to take in the views from his “favourite temple”. 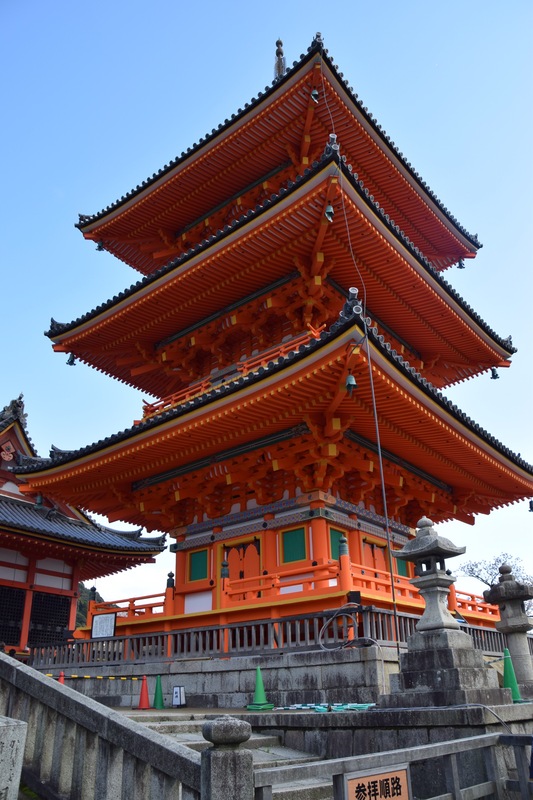 And, yes it was worth it… The extreme orange-ness of the pagoda, the engineering feat of the temple itself, and the views out over Kyoto- wow! It’s not just the big sights that amaze, but the small ones too. 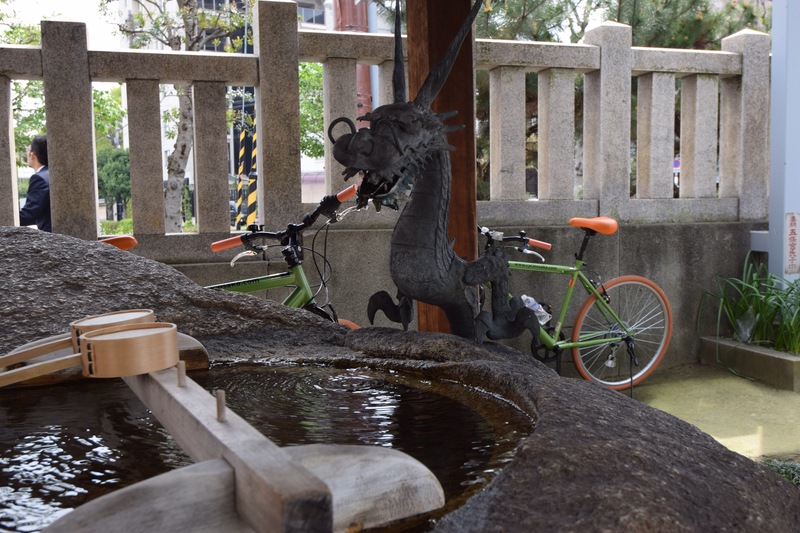 Peter’s penchant for dragons has been very well catered for at these often smallish shrines, each with their own dragon watching over the waters of purification. Though an elder local visiting Kyomisidera told me it’s all the same water, as he shunned the long queue (including Howard, Rob and Izzy) waiting for purification in the waters of eternal life, to just kneel by the side of the pool and splash some over his head without the requisite ritual! Too exhausted for anything but bed, Pip and I took the kids home, missing out on the visit to Gion on the way back, and the chance encounter with some geishas. Oh well, put it on the list for next time! 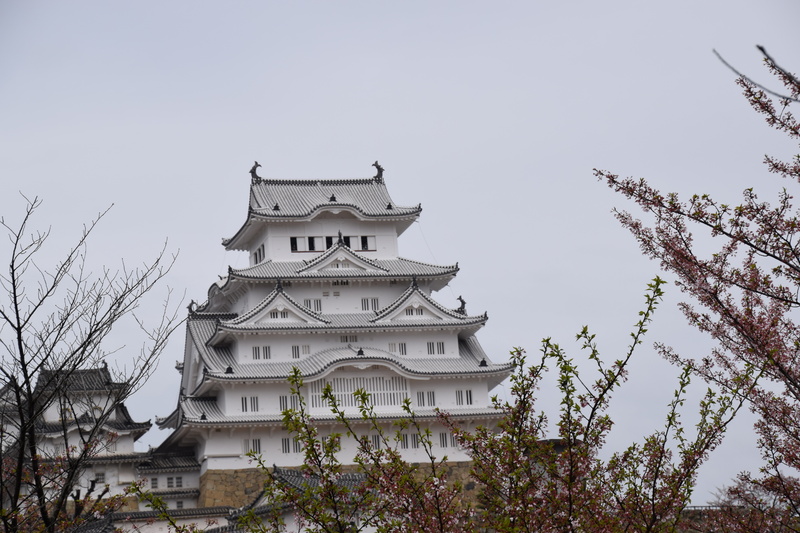 Definitely ticked off the list, though, was Himeji Castle – another attraction designed to confuse those pesky ninjas (a definite theme here – more on our ninja experience in another post). A side trip from Osaka on a rainy day, we were definitely getting value from our JR rail passes! 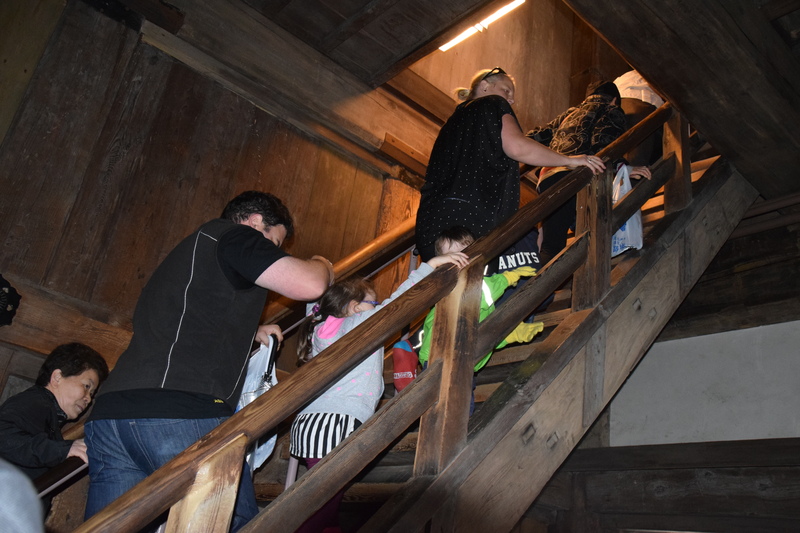 Up the hill to the castle, and then up and up staircase after staircase, through the seven internal floors despite the apparent five stories visible from the exterior. Made me think of my mother’s retirement village, where apartments 101-199 are on the second floor, 201-299 on the 3rd floor and so on. Definitely designed to confuse! 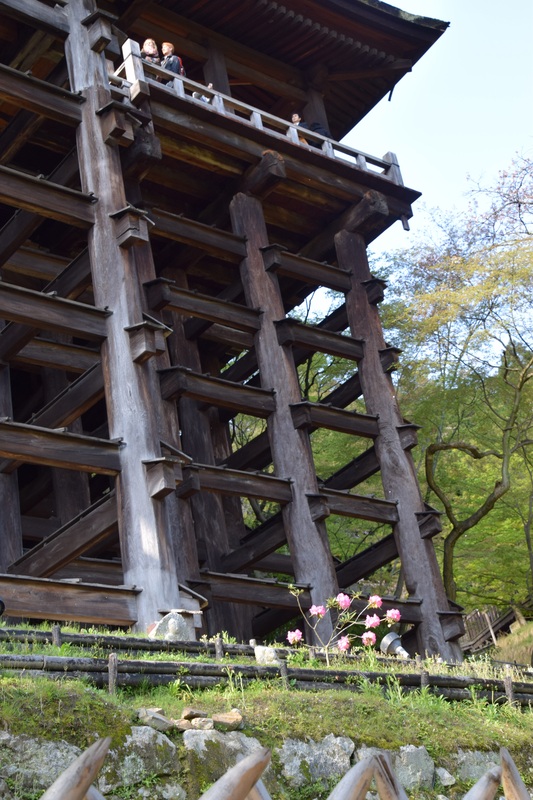 Izzy and Matthew made it up all seven flights – along with a massive crowd of hobbling decrepitude (maybe Himeji is something you just have to see before you die?) In which case, we got in early! And while Rob and Jenna made an excursion out of Osaka to one of the oldest Shinto shrines in Japan, per and I (and the other cyclist so) visited the original home of Japanese Buddhism, admiring the turtles, and chuckling at the random “event” going on on the side – a blessing ceremony for Osaka’s florists, according to our Japanese-speaking guide. Though I preferred my original translation of the mimed explanation, which included much “snipping” actions! 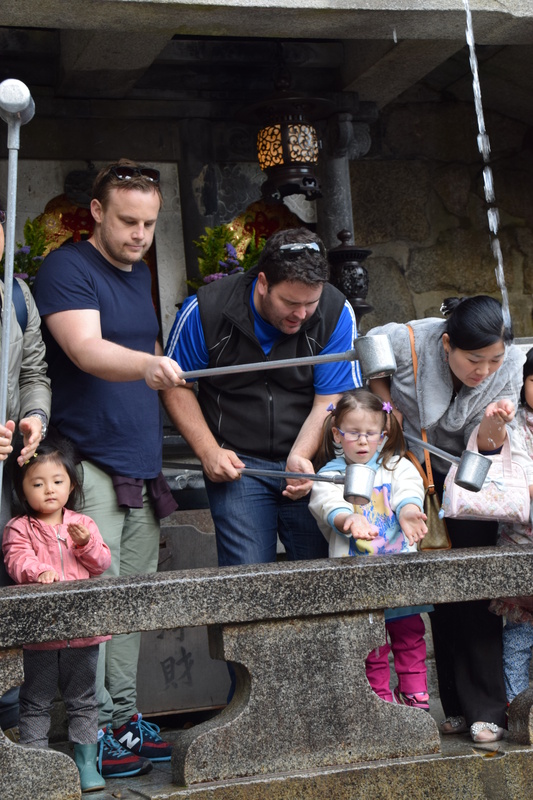 So that was our collection of castles, shrines and temples – though there were a few more religious-type rituals to report on. Mostly, I was struck by the extreme pragmatism, almost a hedging of bets, with people apparently attending different types of worship or supplication, depending on their need or mood on the day. Fascinating stuff!